JUST REDUCED! Villa by Insight Homes. The SPACE of a detached home with the CONVENIENCE of a villa! 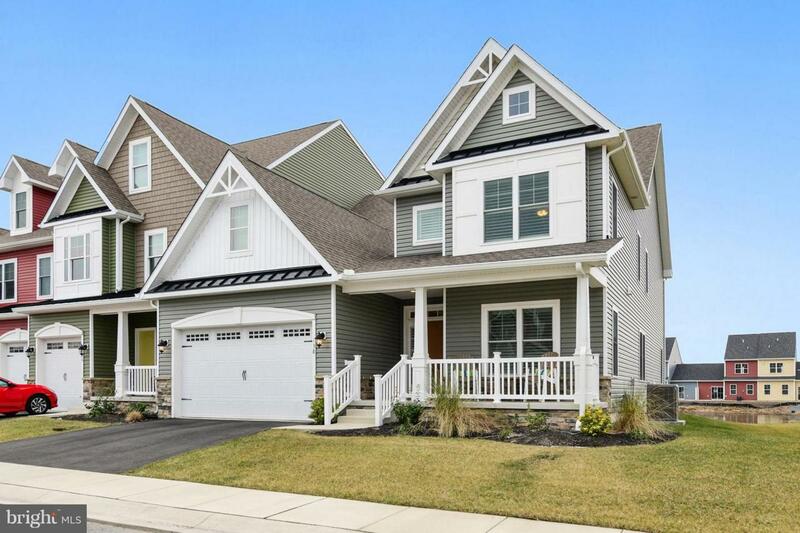 This unique 2 story design offers FIRST FLOOR LIVING: large mastersuite, guest bedroom with full bath, study and laundry room on lower level. Light filled living area is 2 stories high with hard wood floors throughout, upper and lower windows with pond views, living room features gas fireplace with wood painted mantel with granite accents, large dining area fits table for 6, kitchen features stainless gas stove, builtin microwave, French Door refrigerator and top of the line dishwasher, granite counters, large island and custom solid maple cabinets. Solid wood railed stairs lead to spacious second floor open loft - use as TV room, workout area, technology nook, or all three! Oversized 3rd bedroom has full bath, walk-in closet and plenty of morning light. Large walk-in storage is a must have. Use sliders off the dining room, or the door from the master suite to relax and entertain on your expansive custom 300+ sq. ft. deck overlooking the pond, and spend your evenings chatting on the large covered front porch. Whole house air filtration system. Save big on utility bills with STATE OF THE ART ENERGY EFFICIENT FEATURES such as Rinnai hot water on demand, dual fuel hybrid heating system, Low-E energy efficient windows, and high R-value thermal insulation throughout. Additional features: ceiling fans throughout, central vacuum, ethernet and cable wiring, 2-car garage, plantation shutters in bedrooms, honeycomb blinds in living areas with remote for upper blinds, exceptional sound insulation, gas dryer, gas hookup on deck; numerous additional upgrades include granite counters and tile in 1st floor bathrooms - floor to ceiling tiling in master shower - crown molding, bonus windows, upgraded carpeting in bedrooms, study and loft, etc. CAREFREE exterior w/lawn care, irrigation and exterior maintenance included in fees. Amenities include resort style pool, clubhouse w/workout room and tennis/pickleball courts. This is a must-see, one of a kind home! Exclusions Big Screen Tv in Lr. All Furnishings. Green Remarks Custom Villa Built By Insight Homes Which is The Number One Home Builder in Sussex County For Energy Conservation. Broan Ultra Silent Smartsense Fresh Air System. Windows All Super Low-E Double Hung Windows. Advanced Framing 2X6 Studs & insulated Headers. Engineered Trusses W/Energy Heels & Engineered Flooring System. Two State Air Sealing W/3Rd Party Performance Testing & Verification. Superb Sound insulation Between Units.